What do you do when all of your plans go sideways? Picture this: It's 1990 and you're in one of, if not the most hotly tipped rock band in the United States. Tons of press, sold out club shows around Southern California and girls lining up as far as the eye can see. And then … nothing. The ride comes to an abrupt halt and you're left scratching your head and wondering where and how it all went wrong. Nearly thirty years after the band's only album was shelved it sees the light of day through 20th Century Music. Let's go back to the beginning, though, shall we? The band initially came together when San Diego transplant Steven Ray Anastos left his band CITY SLICK only to discover that another band from his hometown, AIRCRAFT, had also called it a day. Having admired that band's material, Anastos decided to call guitarist Ronny Jones to see if they might put something together to test the waters and soon after Steven and the bulk of AIRCRAFT were in business as BLACK BAMBI. "We took off right out of the gate writing new songs and rehearsing nearly every single night. It was a very exciting time and we were very optimistic that we had a sound that was unlike anyone else in Los Angeles at that time” recalls Anastos. Regarding the band’s songwriting process, Steven says: "Our songs always started with Ronny writing a cool guitar riff, which seemed to come very easily to him back then, and I would write the melody and lyrics. I was reading lots of Vampire books at the time and was very much into poetry, Jim Morrison, etc., so lots of the lyrics are a little bit twisted and moody. Again, things always came together effortlessly, and John & Dave certainly added a solid backbone to our sound." 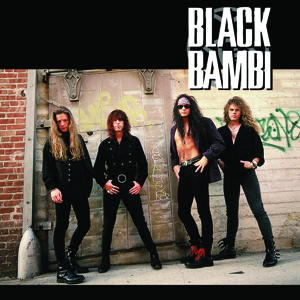 Opening slots with both BADLANDS and THE BLACK CROWES followed and BLACK BAMBI were primed for major success. And then the bottom fell out. John Carter left Atlantic Records soon after and suddenly the band had no one at the label in their corner. Leaving the label shortly after, they began showcasing for other major labels with everyone having a different vision for the band than they had for themselves. Steven recalls: “We were broken hearted, man. Our dreams were slipping though our fingers and there was absolutely nothing we could do about it. Naturally, the band began to splinter and within a few months we were done. Since that time, nearly 30 years actually, we have received countless emails & inquiries from all over the world asking if the LP is available and where it can be purchased. We truly appreciate your interest and your excitement about our lost album, and now we can say yes, it is available either on Limited Edition CD or digitally on iTunes. So, come and get it …"
Good things come to those that wait, indeed.